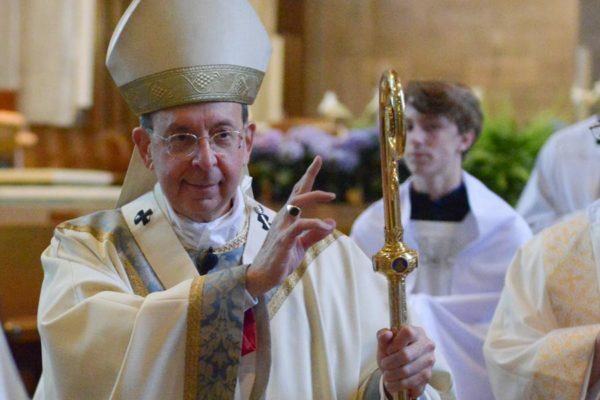 As this 136th Supreme Convention concludes, let me say, once again, how honored the Archdiocese of Baltimore and its archbishop have been to welcome you, my brother Knights, and your families, and friends of the order. As was mentioned at the States Dinner, this marks the third time the convention was held in Baltimore – the first was in 1965, the second in 1989 – my fond hope is that the 2018 convention will not be the last! This archdiocesan family of faith has rejoiced to share with you our faith, our life of prayer, our history and heritage, our crab cakes and some good old-fashioned Maryland hospitality. Let me also thank you most sincerely for the support of the Knights of Columbus for the new Catholic school that will be constructed on the west side of Baltimore. This school will be located not far from the neighborhoods where, in 2015, riots erupted resulting in injury and destruction. This school will serve nearly 500 children, Pre-K to 8, from some of Baltimore’s most underserved neighborhoods, offering them a state-of-the-art school, a safe environment and a wonderful Catholic education. Really, we’re offering them a chance to succeed in this life and the next. This new school will also be a neighborhood resource and a catalyst for neighborhood renewal. Thank you for this act of charity – it will be repaid in the lives of many deserving young people for years to come. On their behalf and on behalf of their families, I truly do thank you! Our Supreme Knight described it well in his report so I’ll just remind you of the basic intent of the program. It’s meant to be a very practical way to guide council activities. Its foundation is the Building the Domestic Church While Strengthening Our Parishes Initiative. It offers a framework by which we and our brother Knights can live our faith boldly and bring hope to the individuals, to families, to the Church and to the world. It is a very practical way of making the council meeting more than a business meeting but a time when we as Catholic men can see the spiritual side of our order and commit to engaging in the important initiatives of the order in the areas of faith, family, community and life. It’s a way to live and express our faith in a hands-on way, things we can reflect on and do together in unity and fraternity in service to our neighbor in ways that familiar to us but also in ways that are new. Not unrelated to this is the Supreme Chaplain’s Monthly Challenge found on the page opposite my column in Columbia, in Knightline and online. It’s based on a reflection of a brief Scripture passage — such as the Lord’s admonition to his disciples to come away for rest and prayer. But it quickly moves to a practical challenge – how do we apply what the Lord said to our lives? One of the ways in this day and age is to unplug our devices, turn off TV, spend at least five minutes a day in mental prayer. Very practical. Something we can all do. Something we can help each other do. Let me add a special word of support for this year’s pilgrim icon program. The image of “Our Lady of Persecuted Christians” is especially beautiful and it opens our heart to Mary’s maternal love and care for those who are persecuted and dispossessed simply because of their faith. Often, the plight of persecuted Christians in the Middle East and elsewhere is forgotten. But their sufferings and trials are very real. As this pilgrim icon travels through our jurisdictions, may it serve to remind us of their plight and prompt us to pray for them, to regard them as truly our brothers and sisters, and to be generous in supporting the efforts of the order to help them, especially efforts of resettlement. We often speak of the Knights of Columbus as “the strong right arm of the Church.”And we live up to this moniker in many different ways: . . . we support the defend the Holy Father and support his charities; . . . we provide for many projects for the Holy See; . . . think of the support the Knights offers to bishops’ conferences in all the countries represented here this afternoon; . . . consider our support for persecuted Christians and their churches; . . . think of the many ways we support to our local parishes and clergy . . . and so much more. When things are tranquil and the news is fairly good, it’s a bit easier for us as Knights to be the strong right arm of the Church. But it’s harder, more challenging when the news is not so good, as is the case in these days and in days to come. Infidelity at the highest levels of the Church strikes a grievous blow at the heart of the Church we love so much. Questions are raised and they will be asked of any one of us who are known to be serious about our Catholic faith. In these days even more is asked of us. You are not being asked, nor should you ever be asked, to defend the indefensible. Looking the other way, shrugging our shoulders, chalking it up to human weakness – none of that is what it means to be the Church’s strong right arm. What the Church asks first and foremost of you in this distressing time is prayer, integrity, strong faith, enduring hope, burning charity – the witness of a life of holiness and charity in spite of everything. More than ever, the Church needs you as Knights to be men of integrity, good husbands and fathers, rooted in faith, enduring in hope, ardent in charity. Just as you and our brother Knights are every day heroes in responding to disasters, to special needs, to people in distress, so too you are being asked to be the first responders to the Church in this very difficult and distressing hour in her history . . . offering your moral support to the clergy who are striving for fidelity and helping your fellow Catholics to keep the faith through thick and thin. As I remarked at the States Dinner, lay persons do indeed assist bishops and priests but their service to the Lord, to the Church, and to the world is not confined to that. By baptism, you have a vocation to holiness, to discipleship, to spread the Gospel and to transform the world. Being a member of the Knights is a very important way to respond to that vocation, to live it to the fullest. And as you reflect on your vocation to holiness and service, think of the lay saints who have stood in the breech in difficult times: such as St. Thomas More, St. Lorenzo Ruiz, Bl. Carlos Rodriguez, St. Giana Molla, not to mention an awful lot of un-canonized lay saints. As you’d imagine, there are various proposals on how to move forward. 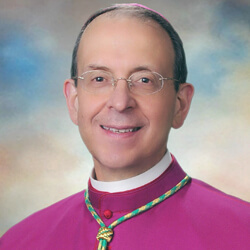 Whatever takes shape, I think it will be important that it is rooted in deep repentance on the part of bishops, that it entails openness and honesty, that it involves the laity, and that is more than a matter of new policies and procedures but rather a sincere effort to grapple in God’s grace with this great evil, with the moral and spiritual dimensions of this crisis. I humbly ask your prayers, I pledge you mine, and I count as always on your support! Speaking of lay persons who make a difference, I know of no lay person or for that matter any member of the clergy whose making more a difference in our Church and in our world than our worthy Supreme Knight Carl Anderson. Thank you for your inspired leadership of our beloved order! Thank you brother Knights for your readiness to follow his lead. Let us ask Father McGivney to deepen in us all a spirit of charity, unity, fraternity and patriotism, so that we might attain holiness, strengthen the Church’s mission, and bear witness to Christ before the world!